This listing has customized options. When in doubt, purchase the item(s) that you need and write up all your special instructions during checkout. PERSONALIZE YOUR ORNAMENTS WITH THESE CUSTOM MINI TAGS! 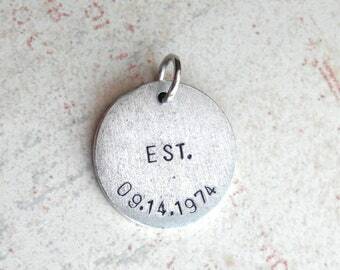 * Each tag has a color-matching 7mm jump ring attached. * Ribbon, cord or ornaments pictured are not included. You can use your own ribbon or string to easily thread through the loop for your ornaments. * Type up all details during checkout including the symbol(s) you want stamped as well as any text. Default font will be 1/16" uppercase Arial. CHECKOUT TIP: If you want to order a combination of these options, just click on "keep shopping" during checkout and you can add additional items to your cart. 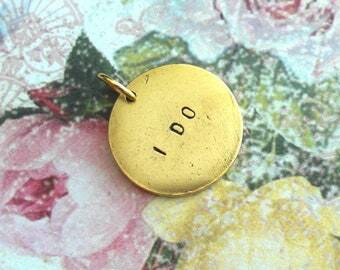 For example, you want the mini square with one symbol and one word PLUS a mini disc with only one symbol. Add both items to your cart separately. If your list is very long (6+ different charms) send me a custom request, include ALL details and I will set up a custom listing for you. Select "Mixed" during checkout only if you are buying more than one tag and need different colors. Mini discs are 1/2" wide. 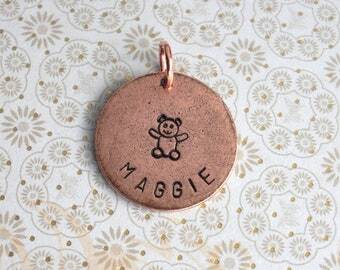 Each charm is stamped by hand, by me. Alignment will vary for each charm. 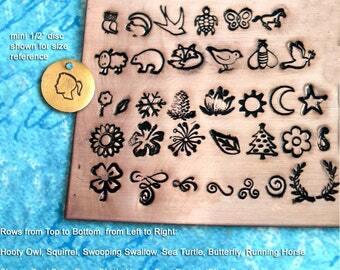 Individual charms will have a jump ring attached. All metals are plated. 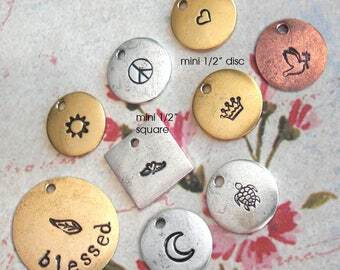 Patina may vary for each charm. 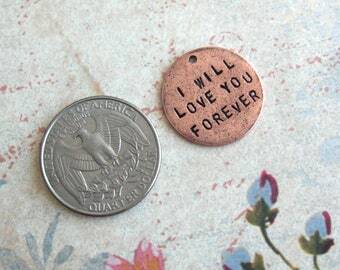 °°° PLEASE NOTE: These are cute and flirty charms, but they may not be stamped in perfect alignment (though I try). Each one is thoroughly unique (like you! ), please allow for slight imperfections. °°° ° These metals have an antiqued look to them; the stamped designs will be antiqued as well. The antiquing will vary from one piece to another. 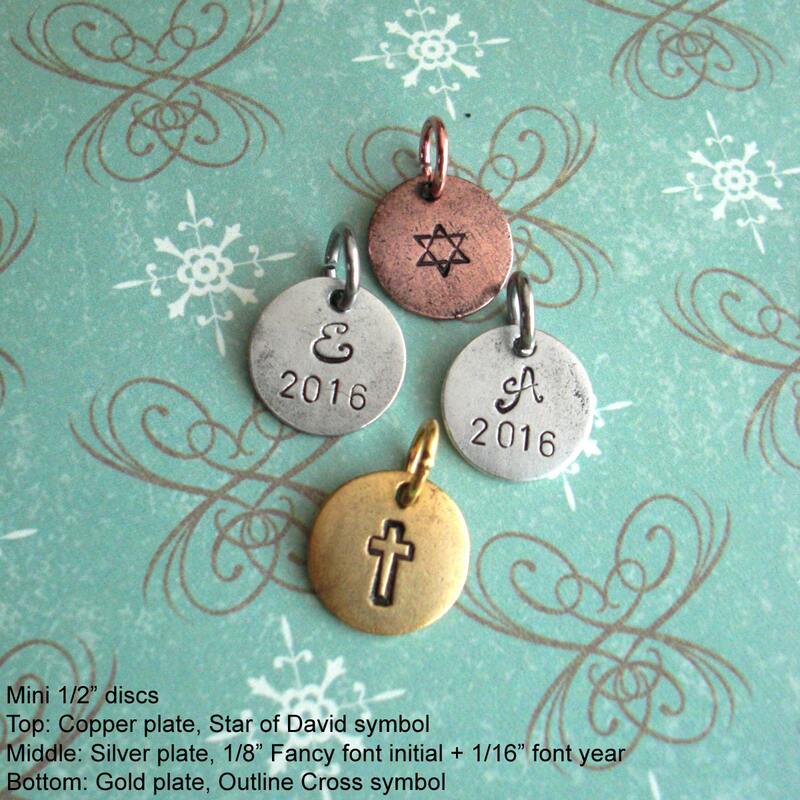 ° Receive a discount of 10% off when ordering 20 or more charms with the same stamping; large orders can take up to two weeks. ° Most orders are completed within a few days and shipped using USPS in the U.S. (estimated shipping times 3-5 business days).